Kanazawa's “hot spots” will warm you up when chilled by rain or snow. In addition to rain, Kanazawa also gets a lot of snow. While snow does not settle on the ground so much in the city center, the cold winters can be harsh. If you feel chilled during sightseeing, head to a warm place for a short break. 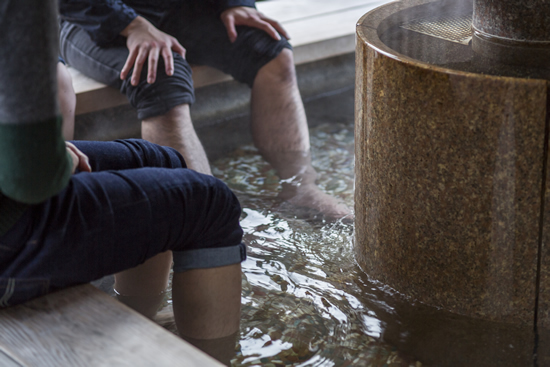 Here, we introduce “hot spots” in Kanazawa where you can warm your body and soul. Shirasagi Footbath is located in the Yuwaku hot spring area, which has long been loved by writers and artists, and is known as the “inner room of Kanazawa.” The footbath can be used free of charge. 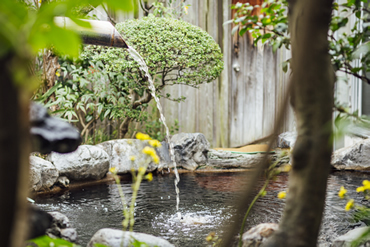 The water is drawn from Shirasagi-no-yu, the water source of Yuwaku hot spring, and has a comfortable temperature, slightly higher than that of the body. The footbath has a pleasant design, which incorporates traditional materials of Kanazawa, including gold leaf, Tomuro stone and wooden latticework, and relieves your tiredness as it gently warms your feet. 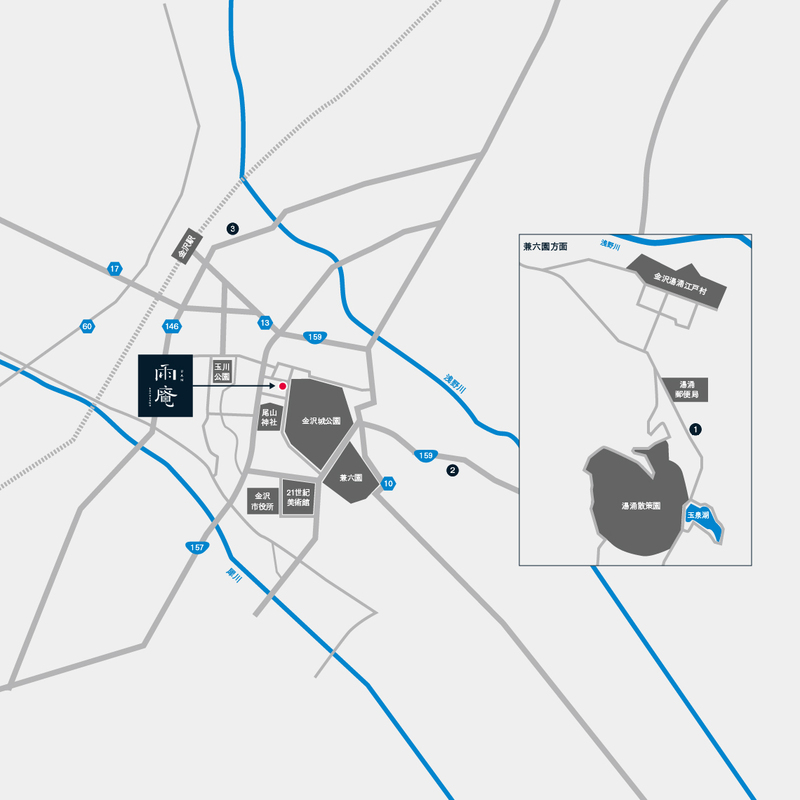 Kanazawa used to be known as a city with many sento, or public baths. It once had over 100 such sento, however, today, only around 20 remain. 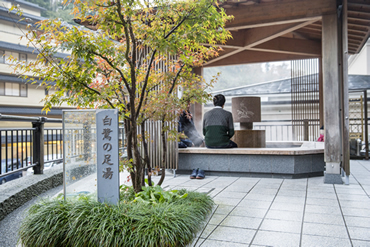 Kenroku hot spring offers a glimpse back to those days when sento flourished. It is located a short walk from Kenroku-en in Akatsukimachi, and has water which is characteristically brown. 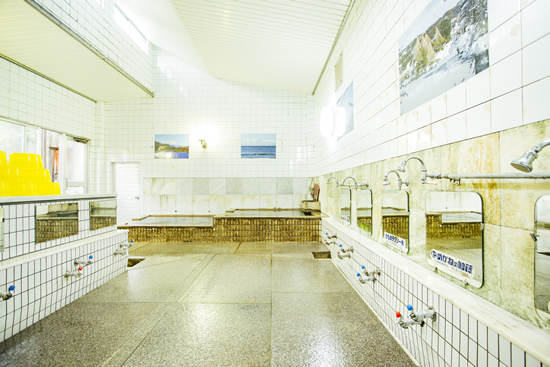 It offers an outdoor bath and a steam sauna for just 440 yen, making it a popular location for both locals and tourists. Restaurants serving the local specialty Kanazawa oden are essential “hot spots” for warming your body, and are located throughout the city. Actually, Kanazawa oden is not clearly defined. 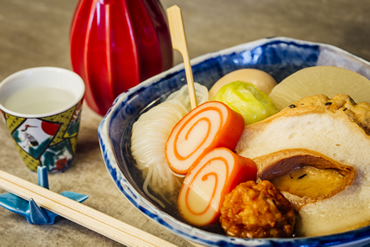 Ingredients differ depending on the restaurant, and a feature of the oden is the variety of ingredients rarely seen in oden in other prefectures, such as crab, Japanese Ivory Shell, and Kuruma-fu gluten cakes. 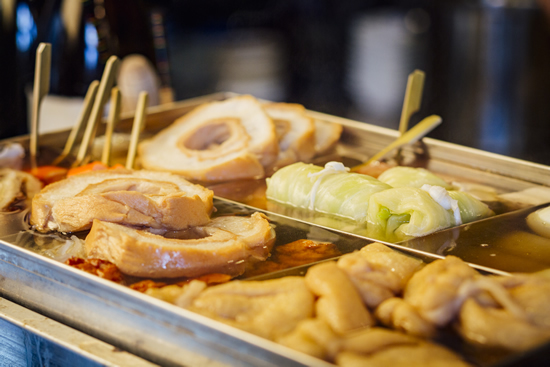 Kanazawa is said to have the highest number of oden restaurants in all of Japan, and it is fun to visit various restaurants and sample the different ingredients they offer. At ORIZURU, which cooperated with the photography, you can enjoy Kanazawa oden together with fresh sashimi and delicious Japanese sake.